What is the importance of Interpersonal skills? What are Interpersonal skills and why are they important for us? Before we go through the examples, it is essential to first define Interpersonal Skills. Interpersonal skills are the qualities and behaviors that we exhibit while we are interacting with other people. They are considered to be one of the most sought after the types of soft skills. We all understand nonverbal or slang language also. We demonstrate them whenever we engage in any kind of verbal or nonverbal communication skills. In a simple word, qualities as basic as bodylanguage and attitude towards others greatly affect our chances of excelling at work. Strong interpersonal skills are a key indicator of success in a working environment or in a working place as benefits include the ability (capability) to cooperate with teammates to solve difficult problems, as well as simply enhancing your popularity around the workplace or among all friends. If we talk on the other hand then lacking them may lead to conflicts with colleagues or management and cause others to see you as a hindrance to getting the job done. Interpersonal skills are sometimes called employ ability skills because for the employee this skill is very useful in communication. The word “employ ability” is the tip-off about the importance of interpersonal skills: they are so crucial that hiring managers really do not want to hire candidates without them, each candidate is a part of company and company will grow by the candidates or employees. When you applying for a position or any post (job), it is important to consider what interpersonal skills are necessary in your target role and industry. Then you need to make every effort or skills that you have learned to match those requirements with demonstrated examples from your own experiences. After all, who is in the company or in our group all are feeling good and match the thoughts of all around us. Then employers are not only looking for a candidate with the right credentials, but also one who will fit in with the culture of the company and contribute to its growth. Many careers require consistent or long time candidates, if not constant, interaction with other people. This is true even for jobs that would seem to favor introverted personalities and independent work designs. For instance, although you’re a technologist or an author or statistician, you still need to be able to communicate and collaborate with your team. Even if you excel at the technical aspects of your job, if you’re a disaster to work with, your presence in the office won't be well received. Interpersonal communication is not an exact science or any other simple thing that can be solved with a math equation or with formula. Interpersonal skills are very complicated as they depend on the context of the situation, social cues and also the personal experience and feelings of those involved. 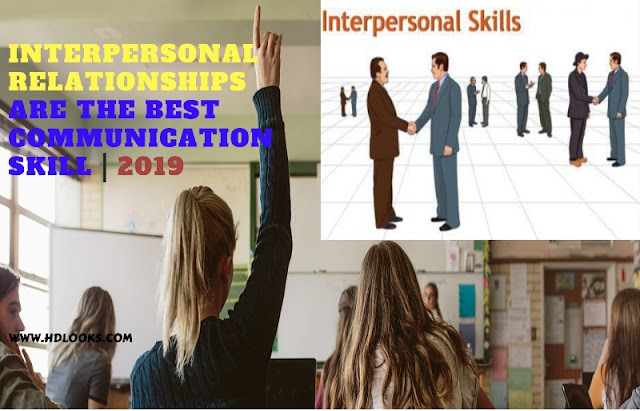 With so many different signals and slang that can influence your communication, it is important to have a tangible understanding of what good interpersonal communication entails. Once you can master in interpersonal communication, you will benefit both personally and professionally. Now a day as person-to-person communication becomes more digital, employers will favor workers that have the ability to communicate effectively without any mistakes with anyone in the workplace (e.g., colleagues, superiors, working friends, teachers and team members). Here One thing to establish or make relationships but to build or make and maintain it, augment relationships with key stakeholders is another benefit of Interpersonal Skills that you have. With it, you can better identify common ground, common communication, improve your empathy and strengthen bonds with key partners. Good interpersonal communication skill can be useful with teamwork and networking that connects you with others, as it causes others to become more invested in your success. When you have earned or get trust from anyone you work with or any one of your friend, you can then more easily overcome unexpected situations and challenges.